The study area contains the Parley's Trail (PRATT), an 8 mile trail from the mouth of Parley's to the Jordan River Parkway (not fully completed). Additionally, it contains the Bonneville Shoreline Trail to the east. 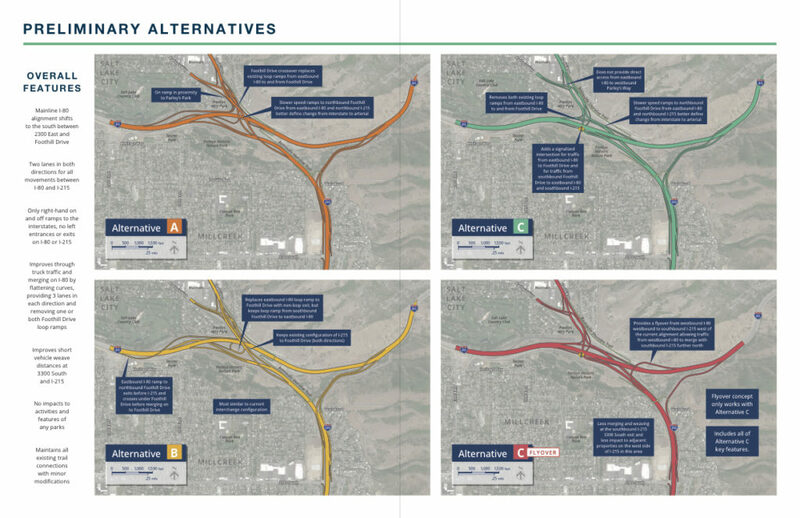 Both of these, along with existing bike facilities on Foothill Drive in Salt Lake City and Wasatch Boulevard to the south of I-80 to 3300 South may likely be impacted by the project. According to UDOT's outreach team, bike lanes on Wasatch would not likely be impacted because, if moved, the width of Wasatch Blvd would remain the same. Additionally, the residential neighborhood east of Wasatch would be affected, as would the Grandeur Peak Trailhead, and the southeast corner of the Parley's Nature Park. The Parley's Canyon Interchange EIS and potential construction needs to take in to account the needs for transportation, recreation, and mountain cyclists. The area is a key crossing point for the Parley's Trail, the Bonneville Shoreline Trail, the potential Parley's Canyon Trail (to the east), and E-W cycling traffic to the north of I-80. While the project documents maintain that there won't be any impact to existing trails and connections, and the outreach team states that their shouldn't be impacts to the bike lanes on Wasatch, the following are points to consider in comments to UDOT. 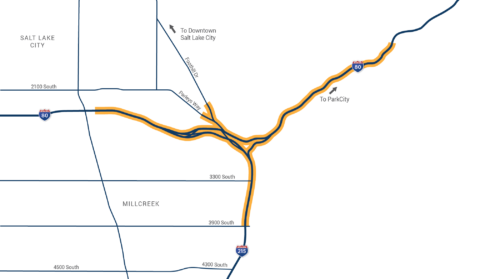 All existing bike connections should be maintained through the network of Parley's Canyon Trail, Foothill Drive, Wasatch Boulevard, and the bridges over the freeways. In particular, bike lanes on Wasatch Blvd need to be maintained. They connect Parley's Trail with the south and east parts of the valley and are critical transportation and recreation facilities. Narrowing Wasatch Blvd to accomodate the new construction is not acceptable if this leads to cyclists being unable to use this corridor. Forcing cyclists into the neighborhoods to the east is not acceptable. If Wasatch Blvd is moved, please add a protected bike facility or paved bike trail alongside Wasatch to 3300 S.
Add a connection from Parley's Way to cross Foothill Boulevard. Parley's Way should have a bike lane installed by Salt Lake City. Work with the Bonneville Shoreline Trail Committee, Salt Lake City, and Millcreek City to improve the BST in this area, and connections to it. Fix the ‘sidewalk' bike path just to the north of the interchange on Foothill Blvd. This needs to be improved as part of this project. Please add more details as to what is being considered, especially on Wasatch Blvd. It's pretty difficult to comment on nebulous plans. Please consider transit as a viable alternative to not undertaking this project. Combine this with improved active transportation alternatives. Since this is an Environmental Impact Study, please consider the impact of inducing demand for more cars to drive, rather than looking for better alternatives.